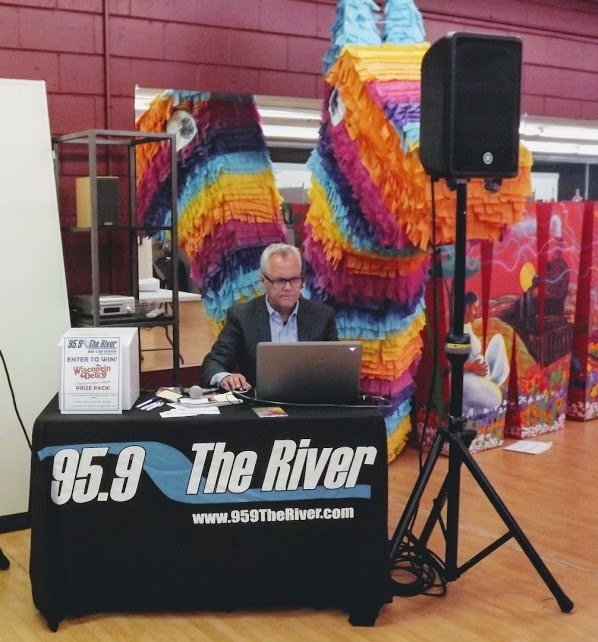 West Chicago, Illinois: May 7, 2018 - Scott Mackay, morning radio personality on 95.9 The River, returns to downtown West Chicago for another live remote broadcast out of Gallery 200, 103 West Washington Street. The event, which takes place on Friday, May 18, 2018 from 12:00 - 2:00 p.m. was organized by the City to help promote Blooming Fest and volunteer efforts currently underway to secure the official designation of West Chicago as an America in Bloom City. The community is invited to be a part of the audience for the live broadcast. “It’s a great opportunity to promote West Chicago pride and build on the enthusiasm of all the hard-working volunteers involved on the Blooming Fest and the America in Bloom committees," said Marketing and Communications Coordinator Rosemary Mackey. A Chance to Learn about the many America in Bloom Efforts. Spearheaded by the City and the West Chicago Park District, a committee which includes residents and organizations such as The GardenWorks Project, Ball Horticultural America in Bloom, People Made Visible, the Forest Preserve District of DuPage, WeGrow Dreams Garden Center, the West Chicago Garden Club, the Green Disciples of the First United Methodist Church, the Western DuPage Chamber of Commerce, as well as the Lions, Rotary and Kiwanis Clubs of West Chicago, has been meeting regularly to plan, organize and roll up its sleeves to tackle projects that will enhance and beautify the entire community. America in Bloom judges scheduled to tour the City on July 26 & 27, 2018. Recently, Willow Creek Wheaton (Willow Wheaton Care Center) held a hugely successful seed-packing event at Wheaton Academy in West Chicago. Over 750 volunteers participated and the effort resulted in 250,000 seed packs that will help to feed families all over the world. On Saturday, May 12, 2018 from 8:00 a.m. - 12:00 p.m., three West Chicago service clubs, Lions, Rotary and Kiwanis, will hold a Downtown Planting Party for the 13 landscape beds along Main Street and Galena Street. The City is supplying the plant material and WeGrow Dreams Garden Center is providing guidance for the selection of plant material and will assist the 60 plus volunteers that are expected. Those interested in participating may sign up on the Giving DuPage volunteer portal. Pizza will be served to all volunteers following the planting. Ball Horticultural Company has generously donated 20 hanging baskets which will complement the landscape beds and the art banners which the Cultural Arts Commission has sponsored again this year. The GardenWorks Project, a DuPage nonprofit dedicated to fighting food insecurity will sell organic vegetable seedlings, give away used gardening tools, and hold a gardening question and answer seminar at Blooming Fest on May 19, 2018 from 9:00 a.m. - 3:00 p.m.
Blooming Fest, West Chicago's established garden festival, is an annual labor of love. The tradition of bringing great variety and value to West Chicago's (and beyond) garden enthusiasts continues this year, with over 80 vendors currently registered to participate. Visitors should expect to see, hear and learn the best practices for creating a "masterful garden" from Illinois Master Gardeners, Ball Horticultural professionals, West Chicago Garden Club members, representatives of The GardenWorks Project and more. Blooming Fest takes place on Saturday, May 19, 2018 from 9:00 a.m. - 3:00 p.m. A complete schedule will be posted on the City's website as soon as it becomes available. For more information or questions about Blooming Fest, contact City of West Chicago Special Events Coordinator Bethany Bayci at bbayci@westchicago.org. To view a new video which highlights Blooming Fest and all of West Chicago’s special events that take place throughout the year, visit https://www.youtube.com/watch?v=yw8bR2qOjHA.